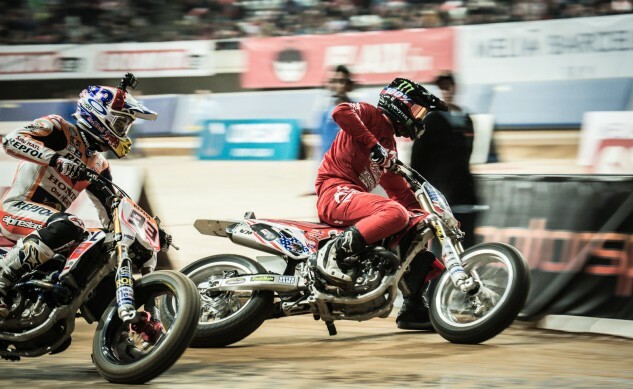 It’s that time of year… Time for the long awaited rematch between American Flat Track’s Brad Baker and MotoGP’s Marc Marquez at the fourth running of the Superprestigio at Palau Saint Jordi in Barcelona, Spain on Saturday, December 17. Once again, FansChoice.tv will live stream the event in the U.S. this Saturday from 12:00 p.m. ET – 3:30 p.m. ET, free of charge thanks to a collaborative effort between American Flat Track and RPM-MKTG, the promoters of the Superprestigio. Three-time MotoGP™ World Champion Marquez will once again aim to beat Baker at his own game. The 2013 Grand National Champion remains undefeated against Marquez, topping the international superstar in both Superprestigio I and III. In 2014, during the second running of the international dirt track spectacular, Baker was sidelined after a crash in practice and Marquez scored a win over three-time Grand National Champion Jared Mees. Mees was invited to take part in this year’s grudge match overseas, but unfortunately he’s still on the mend from an injury suffered in off-season testing. 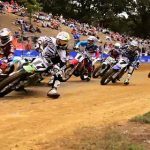 A true All-Star event, the short track exhibition features an invitation-only field comprised of champions and top motorcycle talent from around the world, and a variety of disciplines. 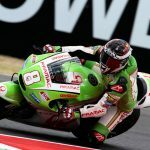 Alongside Marquez, the list includes additional road racing World Champions, including 2014 Moto3 World Champion Alex Marquez, 2010 Moto2 World Champion Toni Elias and 2011 FIM 125cc World Champion Nico Terol. Joining the group of A-list road racers for his Superprestigio debut is former World Superbike racer and fan favorite Ruben Xaus. In addition to Baker, dirt track racing’s international contingent includes National Champions Alan Birtwistle (2016 British DTRA Champion) and Ferran Cardus (2016 RFME Copa de España de Flat Track Champion). 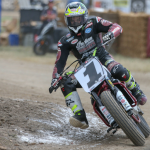 Cardus, the inaugural champion of Spain’s national flat track series, has been training with Baker in recent months and has also been invited by American Flat Track to compete in the AFT Singles class at the 2017 season opener, the DAYTONA TT, on March 16.